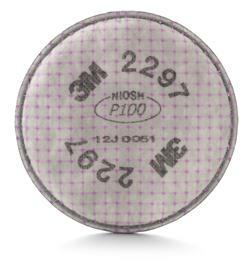 Jaco Aerospace and Industrial is your one stop resource for 3M™ Advanced Particulate Filter 2297, P100, with Nuisance Level Organic Vapor Relief, 100 EA/Case and all of your 3M Products, Tapes, aerospace and industrial needs. SKU Marketplace Product Description: Designed to make breathing easier while lasting longer. NIOSH approved for environments containing certain oil and non-oil based particles. 3M recommended for relief against nuisance level organic vapors and and for ozone protection up to 10X OSHA PEL.